(NASCAR)—Clint Bowyer could catch Martin Truex in the closing laps at Richmond, but he couldn’t get around him for the win. And after brushing the wall with just ten laps to go, he decided to settle for third behind Truex and Joey Logano. Bowyer, who has won at Richmond trice in his career, settled for his fourth straight top-ten finish this year. But he’s confident he’ll be in victory circle before long “Been knocking on the door pretty hard. It’ll open,” he tweeted later. NASCAR is off for Easter next week before moving to the longest track in the series, Talladega on April 28. (INDYCAR)—Alexander Rossi has posted the most dominating win of IndyCar’s Long Beach Grand Prix in more than 25 years. His near-twenty-second victory over Josef Newgarden marks the fourth time he has won from the pole in his six career IndyCar wins. Rossi, whose first IndyCar win was the Indianapolis 500 in 2016, led 71 of the 85 laps at Long Beach and trailed only during pit stops. He’s the first driver to post back-to-back wins at Long Beach since Sebastien Bourdais won three in a row, 2005-2007. 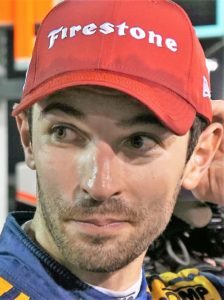 His win is the 200th in all areas in which Andretti Motorsports competes. Rossi’s winning margin is the largest since Al Unser Jr., won by more than twenty-three seconds in 1995. Newgarden, who has finished in the top four in all four races so far this season, retains the points lead, 27 over Rossi. Defending series champion Scott Dixon finished third, being awarded the position over Graham Rahal, who was ruled to have blocked a Dixon pass on the last lap. Dixon is third in the points. IndyCar now heads to Indianapolis to focus on the month of May. Most drivers will get some track time on the oval with an open test on the oval April 24th. They’ll race on the infield road course May 11, a Saturday. Practice for the 103rd Indianapolis 500 begins three days later with qualifying on May 18-19 and the “Greatest Spectacle in Racing” on Sunday, May 29. (FORMULA 1)—Formula 1 is quiet until racing on the Baku Circuit in the Grand Prix of Azerbaijan in two weeks. Teammates Lewis Hamilton and Valtteri Bottas lead the points standings with 68 and 62 points, respectively. Red Bull’s Max Verstappen is third with 39, two ahead of Ferrari’s Sebastian Vettel. Hamilton has won two of the three GPs this year. Bottas has the other title.